Swiftie's famous best friends have been popping up at various stops on her 1989 world tour, and for Friday night's show at New Jersey's MetLife Stadium, the Blank Space singer surprised the crowd by bringing Lena Dunham, Lily Aldridge, Gigi Hadid, and Hailee Steinfeld up on stage. After all four made cameos in her Bad Blood music video, it was definitely an ensemble that got the crowd excited (the major star power probably didn't hurt things, either). 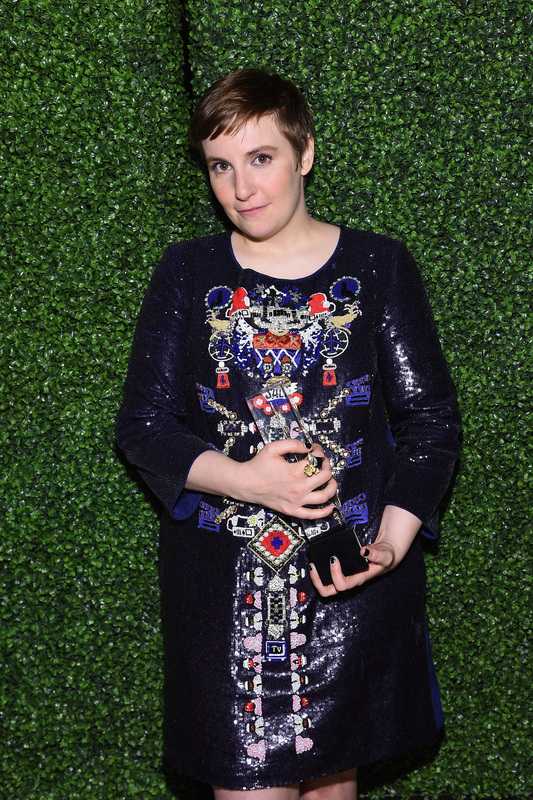 But according to Dunham, it wasn't an experience she'd necessarily repeat. Though she was more than happy to support her friend, Lena revealed, "on most days, I feel really great and fine about my body, but I don't think standing next to, like, three supermodels or so is anything even the most confident woman needs to do." Though I totally get it (I'm 5'3" and those mile-long legs look pretty daunting to stand next to), there's no doubt that Lena looks pretty darn great up there, so here's hoping we see her again on stage, and soon!